It’s a well-known fact that Iceland is an expensive country to visit. To save some money, but still have modern amenities, we recommend staying at Galaxy Pod Hostel. During our visit to the Land of Fire and Ice, we based ourselves in Reykavik. 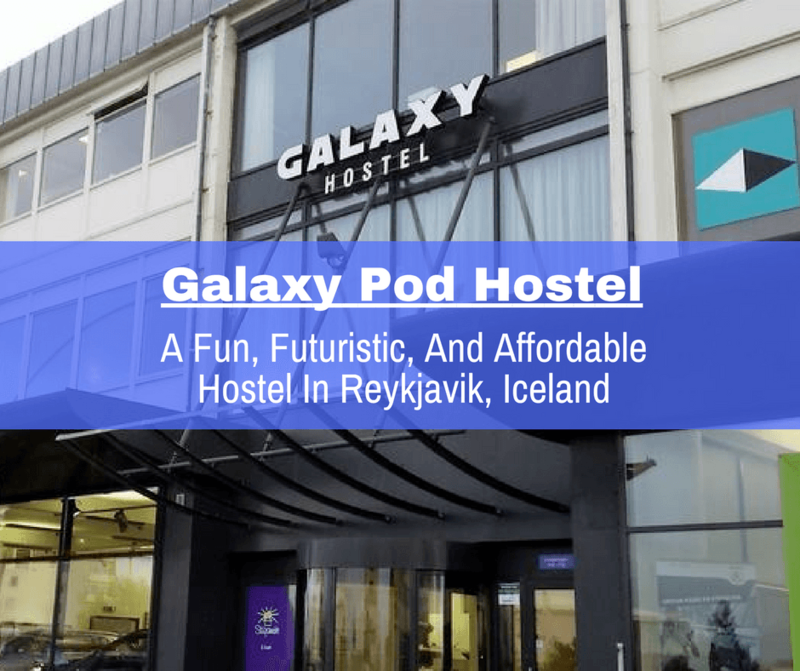 The Galaxy Pod Hostel was perfect for us as it was only a few minutes walk from downtown and close to restaurants, bus stops, and a grocery store. The hostel is located on the 3rd floor of an office building (you can take the stairs or an elevator). The first thing that catches your eye when you walk in is the lounge area. There are a bunch of couches and pillows, perfect for relaxing after a long day of exploring Reykjavik or the surrounding areas. The next thing that will probably catch your eye is the bar (happy hour is from 7pm to 9pm!). Off to the right is the reception desk. You can check in after 2pm and must check out before 11am, but the reception area is open from 7am to 11pm (which is really convenient if you need help with anything or have any questions about the area). And just beyond the reception desk is a wall that you can write your name on; we thought that was a pretty unique feature! Galaxy Pod Hostel also has a pretty modern kitchen area. During our stay we saw plenty of people cooking since it’s a lot cheaper to buy food at the grocery store that’s across the street and cook your own meals. There’s also a big refrigerator where you can keep your food (make sure to properly label) or share food with others (the top shelf is reserved for communal purposes). The bathroom area has multiple sinks, toilets, and showers. It was clean every time we went which is always a big plus for us when we stay in hostels. We really liked that each shower stall was large enough to also have a little stool to put your stuff on; we had plenty of room to dry off and change. There was also a blow dryer which was great because the last thing you want to do in Iceland is go out with wet hair. Note that the bathroom is shared by males and females and if you forget to take your own towel you can rent one from reception for the duration of your stay for 500 ISK (about $4.50). The hostel also has a few different styles of accommodation. The have mixed dorms with multiple bunks and they also have a room with 4 queen-sized beds. We did see a few families staying at the hostel, so we imagine those queen beds are perfect for them. The dorms all have pretty large lockers as well that you can open with a key card that is provided (yay for not having to fumble around with locks and keys!). What we loved the most about our pod was that the mattress came with a memory-foam mattress on top and that we could slide our pod door closed and have some privacy, a luxury you don’t often get in a hostel. The morning view from our room, courtesy of our pod-mate Annette Moore. This was by far the best and coolest hostel we’ve ever stayed in. Everyone that worked there was really friendly and helpful and the free WiFi was really fast. We loved the modern facilities, how close it was to downtown, and the futuristic pods. We would definitely recommend this hostel to anyone who wants to save money but doesn’t want to sacrifice comfort and convenience. If you’d like to know more about Galaxy Pod Hostel, you can email them directly at [email protected] or check out Galaxy Pod Hostel’s website. Have never slept in a pod, but sounds very cool and perfect for those that aren’t used to the dorm style hostels. I thought my hostel days were over, but I would definitely consider staying in one of those pods, and I know how expensive Iceland can be. Great tip. I didn’t know Iceland has pod hotels? That is so cool! I’ve only seen them in Japan before and I just think they are such a unique option for travelers. Got to keep that in mind for my next trip to Iceland! Hi Maria! Yup, they’re one of the few places that has them in Europe! They look like gigantic washing machines from the outside. Super cool concept! I agree completely with this. I met you there as we shared space in the pod room! The hostel welcomed me and I met great folks there! I’ve never stayed in a hostel but the idea of one of those pods seems outrageously fun! I know that Iceland can be pretty expensive, so I love the lower cost alternative. The hostel looks very clean and well kept up. A capsule hotel in Iceland? Who knew! Love the idea of this, as I think pods are the perfect set-up for a hostel. Hopefully we’ll see this become more common. I’ve never slept in a pod but am totally open to it. Especially if it gives you more privacy. I would appreciate that. Since I do hope to make it to Iceland someday, I’ll be keeping this information stashed away for a future date! Those pods are awesome! I’ve never heard of them outside of Japan, but it’s one more reason to visit Iceland. I’m such a light sleeper that dorm rooms in hostels are impossible so a pod option, and that door you can close sounds wonderful. Must get to Iceland soon! I have never stayed at a hostel nor slept in a pod. This does look super cool though. I’d do it! Although I am not a big fan of hostels, I really like this one especially the pods where you can have some privacy. I am planning a trip to Iceland and as it is expensive I will have this hostel in mind.